Gary Adams helped give his Sumter Flyers all they'd need in this July 1991 game. Coming up in the second inning with one on, Adams knocked a two-run home run, helping his Flyers on to a rain-shortened 4-0 victory, according to The Sumter Item. That home run was one of seven Adams hit that year for Sumter, his third season as a pro. It was also one of the last seven he'd hit, that season being the final season of his brief professional career. 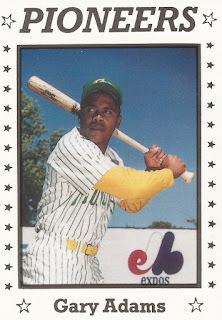 Adams' career began in 1989, taken by the Expos in the 42nd round of the draft, out of Science Hill High School in Tennessee. Adams played his first year in the rookie Gulf Coast League. Over 30 games there, he hit .200, with one home run. He moved to rookie Gate City for 1990, improving his average to .263, over 65 games. At single-A Sumter in 1991, Adams got into 84 games, but hit just .165. In April, it was an Adams single that stood between the opposing pitcher and a no-hitter. He doubled in a run in a June game. Then, in a July game, Adams knocked a three-run home run. But it was his final season as a pro.